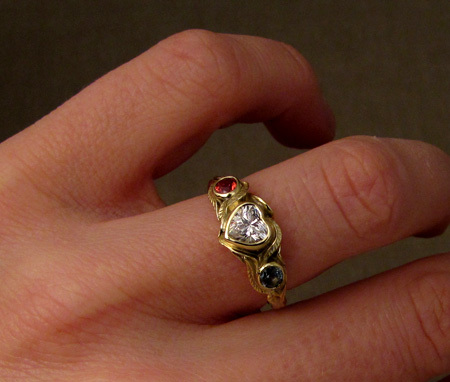 18K yellow gold half-carat heart-shaped diamond ring with two 3mm sapphires on either side, a blue Montana sapphire and a fancy orange-red sapphire. This is the first time I’ve designed a ring with a heart-shaped stone. Previously, I’ll admit I never gave a thought to heart-shaped stones; my brain I guess lumped them together with all things cute and folksy and it didn’t really occur to me to ever use one. But, I have to admit, I really like the cut and this shape for a faceted stone. It was challenging and really fun to design for it.